The Cyprus Chamber of Commerce & Industry participates in the INNOVENTER (Innovative Vocational Social Entrepreneurial Training) project which is co-funded by the Interreg Balkan-Med 2014-2020 programme. Learn more here. The Cyprus Chamber of Commerce and Industry is a private corporate body functioning under special law and is financially independent, free of any influence by the state. 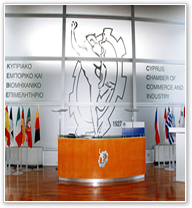 The Chamber is funded by its members’ subscription fees and through income generated from a number of services it provides.The CCCI is the union of Cypriot business people, the interests of whom it promotes by submitting to the government and the Parliament the members’ positions on matters in which they are involved, while, through its participation in tripartite bodies and committees, it conveys and promotes the views of the business community.